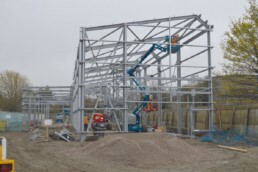 Working on the former site of the famous Pobjoy Mint, we were contracted in early 2015 to design, fabricate and erect three steel frames which overall create a 74,000 ft₂ storage facility. Varying in size, each unit offers a choice of different sized storage bins between 16 ft₂ and 500 ft₂. The frames for each unit were designed with composite action floors, our scope our works also included the supply and installation for the metal decking.